Borscht had been on my 'have to try ' recipe list for long. It comes in two variants - cold and hot. 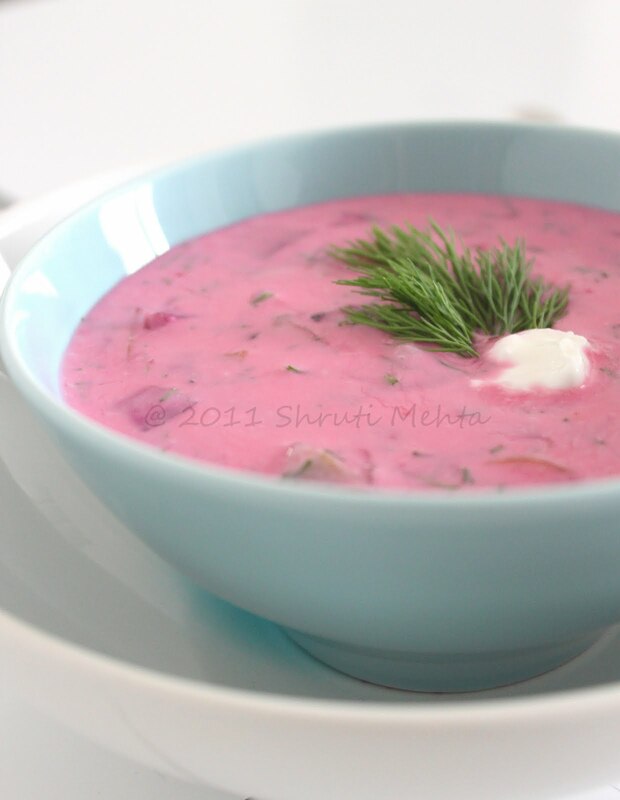 Summer borscht is akin to gazpacho or any other cold soup, a delicious variant in the latter pedigree, from parts of Central and Eastern Europe. We try the cold version to fend of the heat today. So if u love yogurt and beets- look no further at all. And BTW i levitated towards the bright colors of this soup at first and now am totally hooked to the flavors too. The color pink reminds me of the dry colors we played with, during a festival called Holi in India. A good make ahead recipe which you can easily store in your refrigerator for 2-3 days. I feel it tastes better, sitting over a day definitely. 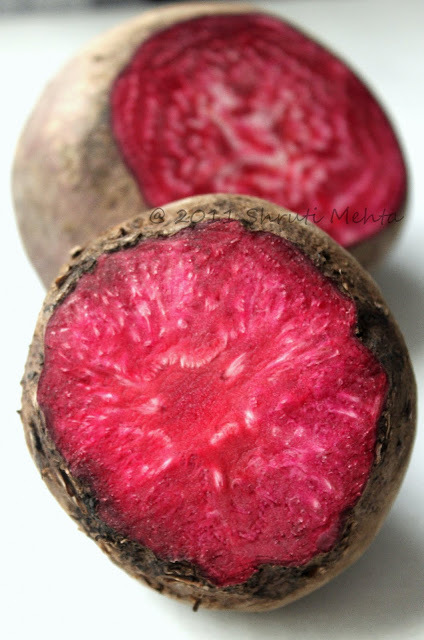 Take a deep pan with enough water to immerse the fresh peeled beets. Simmer over heat till they are tender when poked in the center. Remove the beets with a slotted spoon and place them onto your cutting borad. Reserve the red beet water to be be used later. Let everything cool and cube the beets once they can be handled. Take a seperate deep bowl, whisk in yogurt sour cream sugar salt vinegar and lemon juice. Add in the cubed veges and herbs- beets, carrots, shallots, cucumber, dill. 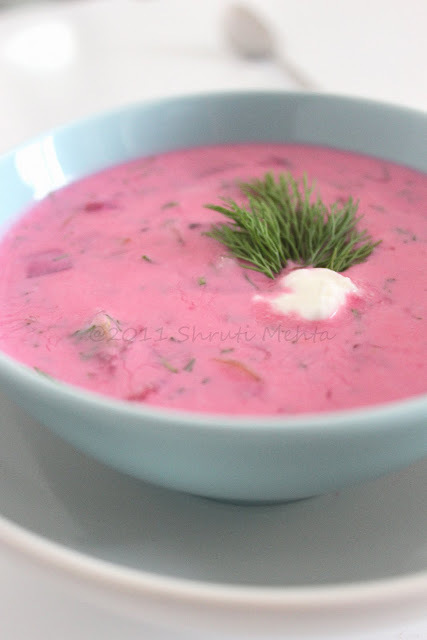 Mix in as much cooled beet water as required, to lighten the consistency of the yogurt vegetable mixture to that of a soup. Stir well and refrigerate for 5hours or overnight. Serve cold with more dill and sour cream to garnish. 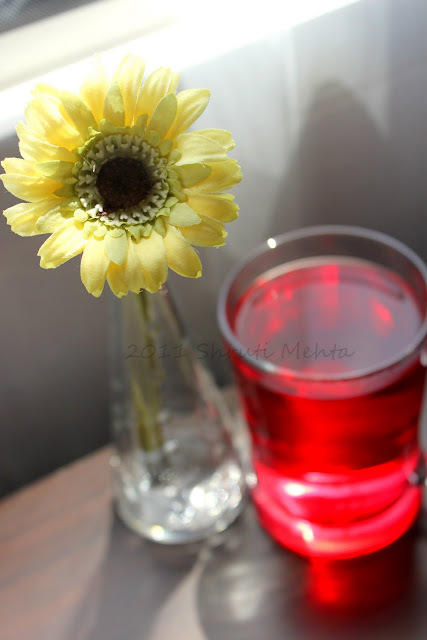 oh.. lovey clicks n healthy recipe !!! So tempting. Lovely color. Nice pictures.